Cis-regulatory modules (CRMs) are distinct, genomic regions surrounding the target gene that can independently activate the promoter to drive transcription. The activation of a CRM is controlled by the binding of a certain combination of transcription factors (TFs). It would be of great benefit if the transcriptional output mediated by a specific CRM could be predicted. Of equal benefit would be identifying in silico a specific CRM as the driver of the expression in a specific tissue or situation. We extend a recently developed biochemical modeling approach to manage both prediction tasks. Given a set of TFs, their protein concentrations, and the positions and binding strengths of each of the TFs in a putative CRM, the model predicts the transcriptional output of the gene. Our approach predicts the location of the regulating CRM by using predicted TF binding sites in regions near the gene as input to the model and searching for the region that yields a predicted transcription rate most closely matching the known rate. Here we show the ability of the model on the example of one of the CRMs regulating the eve gene, MSE2. A model trained on the MSE2 in D. melanogaster was applied to the surrounding sequence of the eve gene in seven other Drosophila species. The model successfully predicts the correct MSE2 location and output in six out of eight Drosophila species we examine. The model is able to generalize from D. melanogaster to other Drosophila species and accurately predicts the location and transcriptional output of MSE2 in those species. However, we also show that the current model is not specific enough to function as a genome-wide CRM scanner, because it incorrectly predicts other genomic regions to be MSE2s. Understanding transcriptional regulation is one of the main goals of the post-genomic era. Transcriptional regulation is a very complex biological phenomenon that is controlled by many factors . Here, we focus on the transcriptional regulation mediated by discrete, genomic (DNA) regions called cis-regulatory modules (CRMs). Each CRM responds independently to a particular set of TFs, and causes a particular level of transcription to occur at the promoter it controls. CRMs might therefore be involved in "situation-specific" gene expression (e.g. tissue specificity). To understand what role CRMs are playing in "situation-specific" gene expression, we need computational models that predict the genomic location of the CRM responsible for triggering the expression of the target gene in a specific situation. Similarly important are computational models that predict the transcription rate mediated by a given DNA sequence. Those models can be applied to identify DNA regions with regulatory functions. Here, we present a single computational model applicable to both prediction tasks on a specific gene in D. melanogaster. Our approach is distinct from previously reported CRM predictors (e.g. Berman et al. ) because it not only predicts the location of putative CRMs, but also assigns a specific transcriptional response to a single CRM. To accommodate the second prediction task, the model can also be used to predict the transcription rate of the target gene mediated by any DNA sequence. To achieve this, we extend a recently-developed, steady-state, quantitative model of the transcriptional regulation of a particular gene in the fruit-fly (D. melanogaster) . This model was originally described by Reinitz et al. , and will be referred to herein as the "Reinitz" model. Earlier work successfully tested the Reinitz model on the even-skipped gene (eve) in D. melanogaster, which controls segmentation in the fruit-fly and is expressed in seven stripes along the anteroposterior axis in the embryo . More specifically, they applied the model to the CRM controlling the second (and to a lesser degree the seventh) stripe. This CRM is called "minimal stripe element two" (MSE2), and is located 1.7 kb upstream of the eve gene . The ability of the Reinitz model to describe the output of MSE2 is of particular interest in light of a very recent study by Segal et al. . They studied a different mathematical model of regulation in D. melanogaster that fails to predict the output of MSE2 correctly. One of the reasons that the Reinitz model accurately models the behavior of MSE2 might be that a different regulatory role was assigned to one of the TFs, Hunchback (hb). Segal et al. used hb as repressor while Janssens et al. used it as activator. Another difference between the approaches is that the Reinitz model was applied to a very detailed measurements of the output of MSE2 and the seven controlling TFs-hb, Bicoid (bcd), Caudal (cad), Giant (gt), Krüppel (kr), Knirps (kni) and Tailless (tll) [9, 8]. This also sets the Reinitz model apart from other modeling approaches introduced by Bolouri et al. and Zinzen et al. . The Reinitz model aims to simulate the TF-DNA binding and interaction events. It divides the set of regulators into activators and repressors, here called "quenchers". The model contains adjustable parameters that describe the maximal transcription rate (R0) and the energy barrier (X0). In addition, the parameter set also contains two variables for each TF that define its ability to bind to the DNA (association constant, K) and its effectiveness as a quencher or activator, (E). The model predicts the transcriptional output of a promoter due to the action of a particular CRM, where the CRM is represented by a transcription factor binding site map ("TFBS-map") specifying the positions and binding strengths of all binding sites for the set of TFs. TFBS binding strengths are given as log-odds scores derived from a position weight matrix (PWM) for the corresponding TF. Janssens et al. first applied the Reinitz model to the MSE2 in D. melanogaster. They used a mixture of predicted and experimentally verified TFBSs, which we will refer to as "knowledge-based" TFBSs. They also introduced additional free parameters to the original Reinitz model that allow for individual binding site affinities that are not in agreement with the theoretical justification for the Reinitz model. We refer to this variation of the original model as the "Janssens model". Janssens et al. showed that the Janssens model could be trained to fit the data on the expression level of eve at different times and locations in the developing D. melanogaster embryo. They also showed that the model correctly predicts (qualitatively) the effect on eve expression in a D. melanogaster mutant lacking one TF (kni). In addition, they showed that the model correctly predicts qualitative changes in anteroposterior location of eve expression, as well as increases and decreases in expression, caused by various mutations of TFBSs. Janssens et al. primarily studied the ability of a variation of the Reinitz model to accurately describe transcriptional output of the eve gene in D. melanogaster as a function of the concentration of certain TFs and their predicted binding to a particular CRM. The current work, however, aims to use the original Reinitz model in the two predictive tasks stated above: to predict the transcriptional output of the eve MSE2 in D. melanogaster, and to predict the genomic location of MSE2 in D. melanogaster and other Drosophila species. An additional objective of the current work is the verification of the generalization accuracy of the Janssens model. By generalization accuracy, we refer to how well the model captures the underlying mechanisms of transcriptional regulation, rather than just fitting the training data. We do this using standard cross-validation. It is believed that the eve gene in other Drosophila species is subject to the same regulatory mechanisms as it is in D. melanogaster. While the function is conserved, the MSE2 sequence and the extent of the regulatory region has changed. Ludwig et al. investigated D. pseudoobscura and three close relatives to D. melanogaster. They found that a DNA fragment containing the MSE2 from the other species was able to drive the correct stripe 2 expression when combined with a lacZ reporter and transfected into D. melanogaster. To investigate if the Reinitz model correctly predicts the stripe 2 expression given the MSE2 regions from other species, we train the model on the MSE2 region in D. melanogaster, and evaluate its predictions on the MSE2 regions in seven other Drosophila species. The goal is to confirm the ability of the model to correctly predict the transcriptional output mediated by the CRM in other species. This will verify the assumption that, though the MSE2 region has evolved, the regulatory mechanisms have stayed the same . To investigate the ability of our approach to identify the location of a specific CRM, we use it in a simple DNA scanning algorithm. The task is to identify the MSE2 region in the DNA sequence surrounding eve in D. melanogaster and other species of Drosophila by finding the DNA region that the model predicts will produce the correct transcriptional output. This will determine the specificity of the model in distinguishing between the true MSE2 and other TFBS-clusters with TFBSs of the same set of TFs but with "wrong" order, spacing and quantity. The previous work by Janssens applied (a variant of) the Reinitz model to TFBS-maps with mainly experimentally-validated TFBSs. However, in general, only a small fraction of functional TFBSs are experimentally validated. Therefore, for the model more generally applicable in a scanning algorithm, it should be able to function well using TFBS-maps consisting solely of predicted TFBSs. However, because in silico prediction of TFBSs is notoriously error-prone , the model needs to be robust enough to cope with wrongly predicted and missing TFBSs. We investigate the robustness by comparing the performance of the Janssens model with the Reinitz model using predicted-only TFBS-maps for MSE2. To assess the performance of the benchmark model-the Janssens model-from a machine learning point of view, we reproduce a modification of the experiment reported by Janssens et al. . Rather than training on the full data set as done by Janssens et al. , we performed a seven fold cross-validation (CV) (see Sec. 0.9 in Methods). Briefly, the data consists of measurements taken at seven time points during the early development of the D. melanogaster embryo. We train the model on all data corresponding to six of the seven time points, and test on the remaining data. We repeat this seven times, leaving out each time point once. The accuracy of the model on each of the seven held-out data sets is a measure of its ability to generalize to unseen data. Because the training process is stochastic and not guaranteed to converge to the optimum parameter values, we repeat the training 30 times for each fold of cross-validation, starting the optimization from different randomly-selected parameter values each time. The Janssens model is able to fit the training data quite well, with an average (standard deviation) root-mean-squared (RMS) error over the six training time points, seven CV-folds and 30 repeats of 8.89 (0.34). This is an average error of 5.5% of the maximal observed mRNA expression rate. Though the testing (cross-validation) error is larger-12.95 (2.33)-, Fig. 1 shows that the characteristic expression of eve generated by MSE2 is qualitatively correctly predicted. Generalization accuracy of the Janssens model. 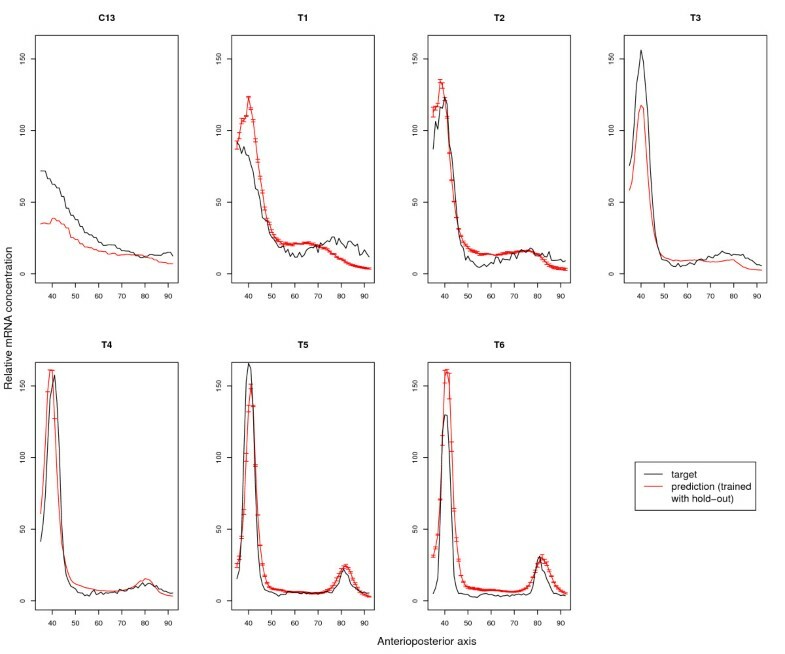 Each panel in the figure shows the measured mRNA level (black curve) and the model-predicted mRNA concentration (red) on the testing data for each of the cross-validation runs where the model was trained on all but this time point. Time points are indicated above each panel. The error-bars indicate the standard deviation among the 30 simulated annealing runs. In order to use the Reinitz model as part of a scanning algorithm capable of identifying DNA regions with regulatory function, it is desirable that the model is applicable to any DNA sequence. This means that the approach should be based on predicted TFBSs only. In this section we train the Reinitz model using predicted sites and compare its performance to the performance of the Janssens model. The TFBS prediction for our model is done as described in Methods Sec. 0.7, and results in 20 TFBSs compared to the 34 "knowledge-based" sites used by Janssens et al. .
Tab. 1 shows the comparison between the Janssens model and our model using predicted TFBSs. Again the reported RMS errors are an average over the six time points and 30 independent runs in each of the seven CV folds. The Janssens model fits the training data slightly better (RMS error 8.89 vs. 9.35). The difference in the training error is small, but statistically significant (two-tailed homoscedastic t-test p-value = 10-16). However, in terms of the generalization accuracy (as measured by testing error), the models are indistinguishable (two-tailed homoscedastic t-test p-value = 0.64). The better ability of the Janssens model to fit the training data might be due to the additional free parameters. These additional parameters appear to enable a closer fit to the training data, while not aiding in capturing the underlying mechanisms of transcriptional regulation, as evidenced by the statistically indistinguishable testing error of the two models. Comparison of the accuracy of the Janssens model and our model. The table shows the average (standard deviation) RMS error for three independent training runs using the Janssens model (knowledge-based TFBS map and extra free parameters) and our model (predicted-only TFBS map and no extra parameters), respectively. Training was done using the simulated annealing algorithm. For the model using predicted sites, we used a log-odds threshold of 9 bits and the D. melanogaster background base frequencies with a total pseudo-count of 1.5. The above experiment indicates that it should be possible to use the Reinitz model trained on predicted-only TFBSs (rather than the Janssens model) as part of a scanning algorithm. We therefore train a final model (TrainedAll model), trained on all time points. It achieves an average training error over the 30 independent repeats of 9.66 (0.01). We noticed that the data points from time points T5 and T6 are very similar to each other (See Sec. 0.9 in Methods). In order to avoid biasing the model, we also evaluate a second final model (TrainedMinusT6 model), which is trained on a "redundancy-reduced" training set, where all data from time point T6 is removed. This model has a training error of 9.00 (0.02). The output of both models is shown in Fig. 2 and the trained parameter values are given in the Supplementary material (Additional file 1). Prediction output of TrainedAll model and TrainedMinusT6 model on all time-points. 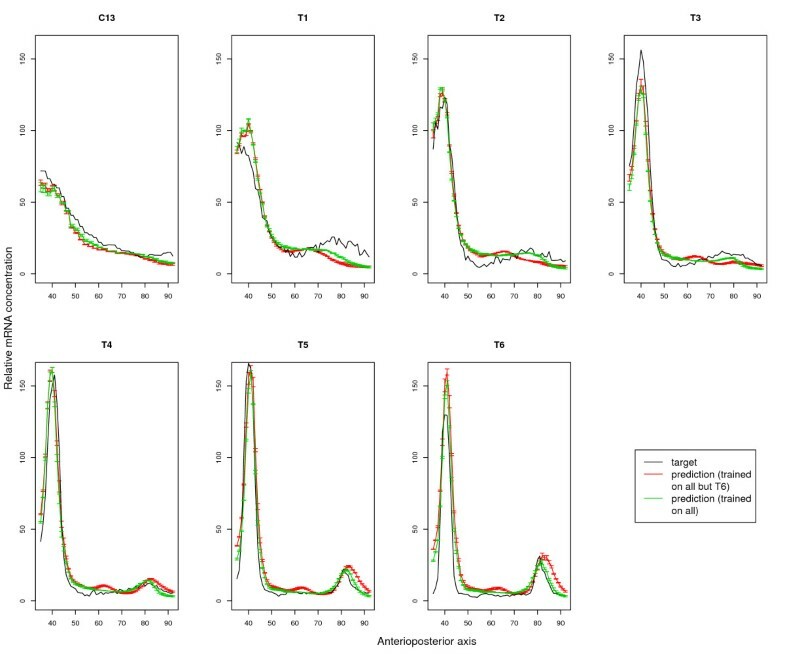 Each panel in the figure shows the measured mRNA level (black curve) and the model-predicted mRNA concentration for one of the seven time points. The green curve belongs to TrainedMinusT6 model, which is trained on the redundancy reduced set and, red curve belongs to TrainedAll model, which is trained on all time-points. The error-bars indicate the standard deviation among the 30 simulated annealing runs. It is believed that the transcriptional output of eve mediated by MSE2 and the protein concentration of the seven TFs have stayed the same despite the speciation . A good indication of the generality of the Reinitz model is therefore its ability to accurately predict the MSE2 location and its mediated transcriptional output in other Drosophila species. To test this, we apply TrainedAll model and TrainedMinusT6 model, trained on the MSE2 in D. melanogaster, to all windows in the 20 kb surrounding the eve gene in D. melanogaster and other Drosophila species (see Methods Sec. 0.11). 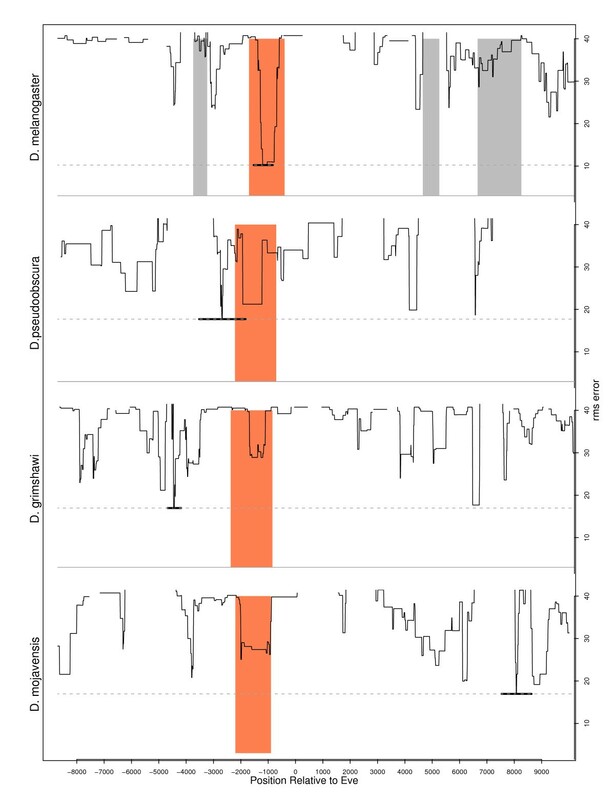 We measure the RMS error for all time points by comparing the predicted output using the MSE2 in a given species with the known transcriptional output for D. melanogaster. Since we do not know the exact extent of the MSE2 in the other species we consider all window sizes ranging from 100 to 2000 bp (100 bp increment), and compute the RMS error of the prediction from each window compared with the known transcriptional output of D. melanogaster for all time points. The window with the lowest RMS error-the "optimal window"-is then the predicted MSE2. To measure the prediction accuracy, we calculate the performance coefficient (PC)  using the sequences aligned to MSE2 in D. melanogaster in the UCSC alignments  (see Sec. 0.10 in Methods) as the "gold standard" for the location and extent of MSE2 in the other species. We compare the ability of our model to predict the location and extent of MSE2 in the various Drosophila species with the CLUSTER-BUSTER algorithm. CLUSTER-BUSTER searches a DNA sequence for clusters of matches to the set of motifs in its input. We provide CLUSTER-BUSTER with the same seven PWMs as used by our model. CLUSTER-BUSTER allows the user to set a parameter controlling the expected gap length between sites in a cluster. We ran CLUSTER-BUSTER with gap lengths from one to 29 and report the highest PC achieved in Fig. 3. To calculate PC for our method, an RMS threshold must be chosen (see Sec. 0.11). We compute the average PC of the 30 TrainedAll models and TrainedMinusT6 models using different RMS thresholds ranging from zero to 25, and report the highest PC achieved. As can be seen in Fig. 3, the predictive accuracy of our models is competitive or better than CLUSTER-BUSTER in three of the seven species other than D. melanogaster (on which the models were trained). On two distant species (D. grimshawi and D. mojavensis) both models are markedly inferior to CLUSTER-BUSTER. Surprisingly, the TrainedMinusT6 model does extremely well at predicting the location of MSE2 in the distantly related species D. willistoni. The results also indicate that the inclusion of time point T6 may be biasing the model toward the later time points. Although the TrainedMinusT6 model achieves a better maximum PC than TrainedAll model for only two species (D. ananassae and D. willistoni), the region with the lowest RMS error overlaps MSE2 on average in 5.5 species (averaged over the 30 TrainedMinusT6 models) compared with 3.3 species for the TrainedAll models (data not shown). Comparison of the performance of different methods for the prediction of the MSE2 locations in D. melanogaster and seven other Drosophila species. The average PC for the 30 different TrainedAll models and TrainedMinusT6 models was calculated for different RMS thresholds. The best PC for each model is displayed in the figure along with the standard deviation. The maximal PC for cluster-buster was chosen among runs with different gap length between TFBSs within a cluster. The performance of our model is illustrated by the predictions made by the TrainedMinusT6 model with the best training error amongst the 30 repeats, herein referred to as "best TrainedMinusT6 model". Fig. 5a shows that the known (or UCSC aligned) MSE2 overlaps the best scoring window predicted by our best TrainedMinusT6 model in six out of eight species. For the two species where the optimal window does not overlap MSE2, the RMS errors at the MSE2 region are among the lowest as shown in Fig. 4. Also shown in the table is the prediction accuracy achieved by the optimal window over all time points. Predicting MSE2 in four Drosophila species. The figure shows the RMS distribution over the 20 kb surrounding eve, predicted by the best TrainedMinusT6 model, trained on the MSE2 region in D. melanogaster. The orange area shows the location of the annotated or homologous MSE2. The grey shaded areas show the location of other MSEs. The horizontal lines mark the location and extent of the window with the lowest error. Accuracy of the best TrainedMinusT6 model in predicting the location of MSE2 in other species. The table shows the results of the model using predicted TFBSs trained on the 1300 bp MSE2 region from D. melanogaster as a predictor. Column one shows evolutionary distances of the examined species as a tree. Columns two to four shows the RMS error and window size of the optimal window and whether or not it overlaps with the UCSC-aligned MSE2. The last column shows the MMETA score, where the MSE2 from D. melanogaster is aligned with the optimal window (the UCSC-aligned MSE2). The abbreviations of the Drosophila species in column one are given in the Supplementary material. To investigate if the predictive accuracy in the other Drosophila species is mainly due to the similarity of its MSE2 region to that of D. melanogaster, we compare the TFBS-map of the window with the best RMS error to the TFBS-map of the training window in D. melanogaster using the TFBS-map alignment tool MMETA . Except for D. melanogaster itself, the MMETA scores are very low, indicating that only a small number of TFBSs in the two maps can be aligned. Therefore, the TFBS-maps in the regions predicted by the best TrainedMinusT6 model differ significantly from the MSE2 TFBS-map for D. melanogaster. The MMETA scores for the predicted MSE2 regions and the UCSC-aligned regions are almost the same (Fig. 5) in all but one species, indicating that the TFBS-map from the window predicted by TrainedMinusT6 model can be aligned to the TFBS-map from D. melanogaster with the same quality as the homologous MSE2 sequence identified by UCSC. Interestingly, in D. ananassae the homologous MSE2 sequence achieves a better MMETA score than the TrainedMinusT6 model-predicted window. This means, that though the TFBSs in the homologous region can be better aligned to the ones from the training region in D. melanogaster, the predicted output is worse than the one mediated by the predicted window, whose TFBSs can not be aligned very well to the MSE2 in D. melanogaster. Which of the positions is the true MSE2 for D. ananassae can only be determined in wet-lab experiments. The TFBS-maps for the predicted regions and UCSC aligned MSE2s as well as a multiple alignment are shown in the Supplementary material (Additional file 2, 3 and 4). Fig. 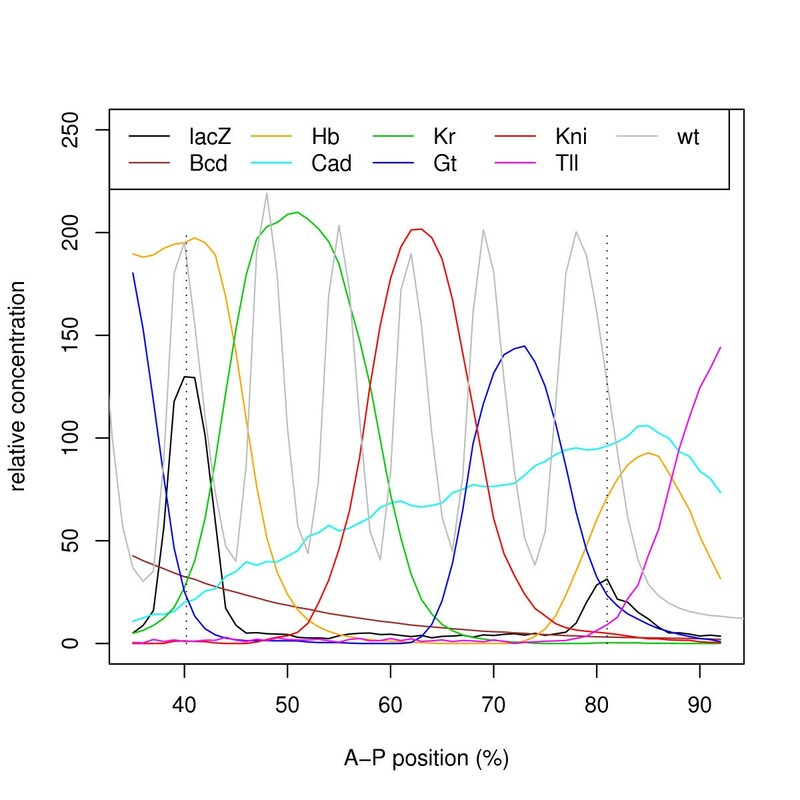 5b illustrates how well the predicted transcriptional response mediated by the optimal windows fit the observed mRNA concentrations. This is particular surprising for the optimal windows that do not overlap the MSE2 (exemplified for D. mojavensis). If not an artifact, they might be additional MSE2 regions. Small et al. found that regions outside the MSE2 aid in increasing the expression level of stripe 2. Their observation was limited to regions within 8 kb upstream of eve. However, it may be that there are additional enhancers within the 20 kb eve locus. As part of the previous experiment, we evaluate the prediction of the best TrainedMinusT6 model using TFBS-maps corresponding to all windows of various sizes in the 20 kb surrounding eve. This detects a window near eve in D. melanogaster with the same RMS error as the training window, but 500 bp shorter. Fig. 6a shows the location of the shorter window relative to the 1300 bp long training window. Location and expression prediction of the MSE2 in D. melanogaster. Panel a: Overlap between the best TrainedMinusT6 model-predicted MSE2, the MSE2 region proposed by Janssens et al. and the annotated MSE2 . The predicted MSE2 was identified as the window with the lowest RMS error amongst all positions and window sizes. Panel b: Predicted mRNA concentration using the MSE2 proposed by Janssens et al. , the predicted MSE2 location and the annotated MSE2 location, respectively. The 1300 bp of the extended MSE2 region used for training was constructed by Janssens et al. to demonstrate that the sequence downstream of the annotated MSE2 has regulatory function and can mediate a weak stripe 7 expression. The extended MSE2 has, therefore, a strong stripe 2 and weak stripe 7 expression in contrast to the annotated MSE2, which only mediates the stripe 2 expression . Since there was no wet-lab experiment undertaken to identify the minimal region able to evoke stripe 2 and stripe 7 expression, it is likely that the 1300 bp construct contains sequence parts with no regulatory function. The shorter (700 bp long) window identified in-silico may therefore be the minimal sequence element evoking the observed pattern, especially because it fully contains MSE2 and extends the region only a short stretch downstream. The predicted outputs of the three regions are shown in Fig. 6b. While the predicted window and the training window produce the same output, the predicted response for the annotated MSE2 is very low. But, as expected, there is only a transcriptional response predicted for stripe 2, and no response at the location of stripe 7. We have introduced a computational tool to predict the transcriptional output mediated by the predicted TFBS-map of a specific CRM. We have generalized a recently developed mathematical model to make it applicable to any DNA sequence. We have demonstrated the ability of the model to predict the transcriptional response and the location of the MSE2 region in other Drosophila species. In six out of the eight Drosophila species, the model identifies the correct position as the window with the lowest RMS error. The overall low RMS error indicates that the model captures the underlying mechanism of transcriptional regulation and generalizes to control regions in other species. However, preliminary studies (not shown) indicate that the current Reinitz model fails to generalize to CRMs other than MSE2. This is in agreement with the recent study by Segal et al. , where their model fails specifically for MSE2, but succeeds for several other CRMs in various Drosophila genes. This suggests that the biological mechanism involved in the regulation of MSE2 may be different than that of other enhancers. This is particularly the case for the transcription factor hb, which seems to be an activator in MSE2 while it seems to be a repressor in other enhancers . How and why the regulatory mechanism can be different for MSE2 although the same set of TFs are involved remains to be investigated. Particularly, the proposed cooperativity between hb and bcd may enable hb to be an activator for the regulation of MSE2. We further plan to substitute the biologically unrealistic discrete TFBSs with continuous binding gradients over the DNA. An interesting intermediate step would be to use TFBSs predicted by CLUSTER-BUSTER, where the reported TFBSs are not chosen based merely on their PWM scores, but by taking their location relative to other TFBSs into account. a TFBS-map, specifying the locations and "strength" of the TFBSs. The Reinitz model computes the transcription rate of a gene regulated by a CRM, given a TFBS-map (specifying the location and log-odds score of each TFBS in a CRM), a set of concentrations of the relevant TFs and the set of free parameters (X0, R0, E s and K s). We intend to give only a brief summary of the model. For more detail, see the Supplementary material (Additional file 5) or the original publications [13, 9]. and artificially clipped at R0 to prevent unrealistically high transcription rates. The eve gene is expressed as vertical stripes in developing D. melanogaster embryos. The expression of eve in the region of the second stripe ("stripe 2"), counting stripes along the anteroposterior axis of the embryo, is known to be controlled by a CRM located about 1.7 kb upstream of the eve gene, illustrated in Fig. 8. This CRM is referred to in the literature as "minimal sequence element for stripe 2" (MSE2). Janssens et al. measured the transcriptional output of a reporter gene construct consisting of the 1.7 kb region upstream of the eve transcription start site (TSS), including the promoter and the 5' UTR, fused to the coding region of lacZ. This region contains the complete MSE2, plus some additional sequence downstream of it. Janssens et al. generated the eve mRNA data by collecting embryos bearing either the full 1.7 kb upstream of the eve gene or just the eve MSE2 region (-1.5 delta -1.1 (MSE)) attached to a lacZ reporter gene . This eve-lacZ fusion gene is expressed in the same way as eve stripe 2. The mRNA of the lacZ gene is visualized using in situ hybridization and antibody staining. The mRNA concentration is proportional to the transcription rate, because the half life of the eve-lacZ fusion gene-mRNA is very short (6 minutes) and can therefore not accumulate over the measured time. Jaeger et al. generated the TF protein concentration data by fluorescently staining D. melanogaster blastoderm stage embryos for the TF proteins using antibodies. The embryos were then laterally oriented and processed with an image segmentation method to obtain the average pixel value within each nucleolus. These values were then grouped into 100 equally sized bins according to their position along the anteroposterior axis. The values in each bin were averaged and normalized to range from 0 to 255 and are defined to be the protein concentration of the TFs. To obtain the final value, the concentration of at least 10 embryos were averaged for each time point. As an example, the complete data for time point T6 is shown in Fig. 7. TF protein concentration and mRNA concentration of the eve-lacZ fusion gene at time-point T6. Dotted lines give the reference point where the mRNA concentration reaches the highest point of the peak. The grey curve is the mRNA concentration of eve in the wild-type. Summary of eve-lacZ fusion gene. Panel A shows the 8 kb of eve 5' flanking sequences. This region has been shown to contain CRMs responsible for the initiation of stripes 2, 3 and 7 (MSE2, MSE3+7), as well as an auto-regulatory element responsible for refinement and maintenance of the seven stripes during gastrulation. Panel B shows the two MSE2-lacZ fusion gene clones used for the mRNA concentration measurements. This picture was adapted from Small et al. Fig.1. For our benchmark model (Janssens model) we used the TFBS-map reported by Janssens et al. . For all other models we used predicted TFBS-maps obtained as follows. We use log-odds position weight matrices (PWMs) for each of the seven TFs to create predicted TFBS-maps. Given a genomic region and the PWM for a TF, we use the motif scanning algorithm FIMO to predict all sites (on both DNA strands) with log-odds score above a threshold, T. FIMO is available as part of the Meta-MEME package (see Availability and requirements section for URL). The positions (relative to the start of the genomic region) and log-odds scores of the predicted sites constitute the TFBS-map. We build the PWMs from so-called "count matrix" motifs representing the binding specificity of each of the TFs. LOGOs showing the information content of each TF motif are shown in the supplement (Additional file 6). To create a log-odds PWM from each count matrix, we first add a pseudo-count to each entry, and then normalize so that the sum in each column of the motif is one. We then divide entries by the background frequencies. Finally, we take the natural logarithm of the entry. We use a log-odds score threshold of 9 bits. We use the same background frequency model as Janssens et al. , which is the base frequency of the D. melanogaster genome: B A = B T = 0.297 and B C = B G = 0.203. We also use this background when predicting TFBSs in other species because the PWM score contributes to the learned parameters. The protocol to provide the PWM scores should therefore not be changed. As pseudo-count we used 1.5 times the background frequency. This value was suggested by Frith et al. to maximize the log likelihood of finding a true positive site in an empirical study with TRANSFAC  matrices and sites. We applied the simulated annealing (SA) algorithm used in Janssens et al. to train the model. This program was kindly provided to us by John Reinitz. Except for the benchmark case with the TFBS-map from Janssens et al. , we always run the SA algorithm with the only free parameters being one association constant, K, and effectiveness constant, E, for each TF. We also inactivated the so-called "direct repression coefficient" parameters (not mentioned in Janssens et al. but present in their program). To use the model in a predictive mode, we use a program named UNFOLD, also provided to us by John Reinitz. This program takes the TFBS-map, the TF concentrations and the trained model parameters as input, and outputs the predicted mRNA concentration, R, for each set of TF concentrations in the input. In our experiments, we train the Reinitz model using the mRNA levels of eve-lacZ fusion gene TF concentrations reported by Janssens et al. , and TFBS-maps obtained from the DNA sequence surrounding eve. The free model parameters are optimized by the training algorithm (SA) to reduce the RMS error between the known transcription rate and the rate predicted by the model, averaged over all input points. Each data point corresponds to a particular time point in the development of a D. melanogaster embryo and a particular location on its anteroposterior axis (see Fig. 7). The time points are labeled C13, T1–T6 and the locations of interest along the anteroposterior axis are from 35% to 92%. We emphasize once more that the model is purely static, and has neither concept of time nor of position within the embryo. To test the ability of the trained model to generalize to unseen data, we perform a seven fold cross-validation with 30 repeats. We divide the data set according to time points into seven subsets. A model is trained on all but one of the seven subsets. This is repeated holding out each of the seven time points exactly once. Because the training algorithm (SA) is stochastic, we repeat the training and testing in each fold multiple times by choosing ten random values for the starting points of the free parameters and starting SA for each set three times using different seeds. The average RMS error of the 30 models and all training time points is referred to as "training error" and the average RMS error of the models on the hold-out time-point is herein referred to as "test error". As shown in Tab. 2, the distance between T5 and T6 is the smallest. To avoid redundancy in the data set, time point T6 was removed because its average RMS distance to all other time points was smaller than the one from T5. 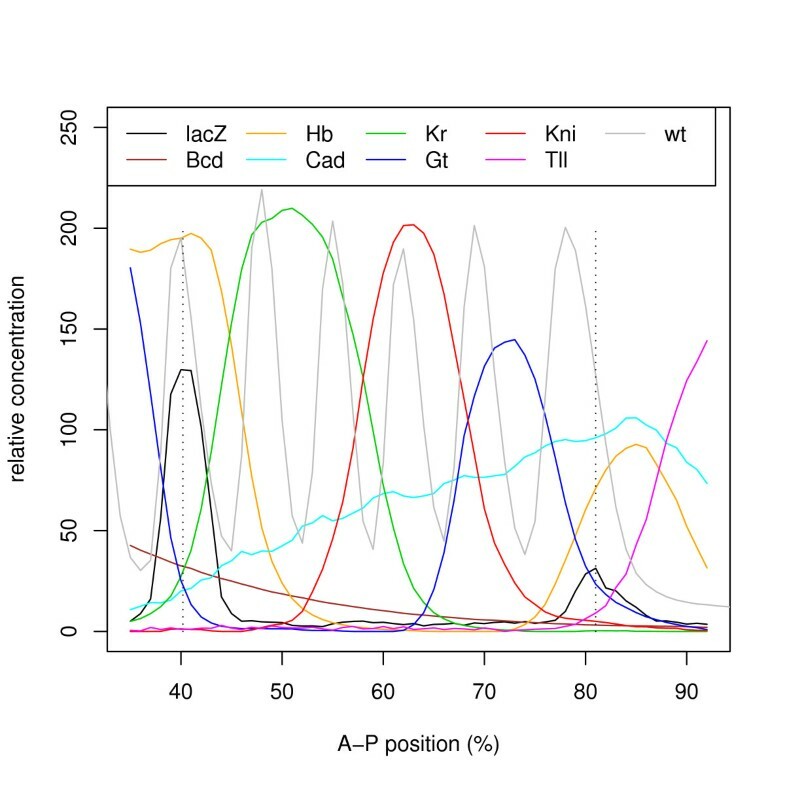 Pairwise distance between the mRNA and TF concentration of adjacent time points. The table shows the pairwise distance as the sum of the RMS distances between the mRNA concentrations and TF concentrations of two time-points. Only adjacent time points are shown; non-adjacent time points have much greater distances. The MSE2 region is known in D. melanogaster and D. pseudoobscura but, to the best of our knowledge, there is no annotation for the other six species. To identify the MSE2-homologue regions in other species we used the UCSC alignments. We first extracted the UCSC sequences aligned via MULTIZ  to the sequence of the 1300 bp of the MSE2 region in D. melanogaster and aligned them then to the 20 kb surrounding the eve gene in each species using ClustalW  to identify putative MSE2 regions. According to Ludwig et al. the similarity of the TFBS-maps between D. melanogaster and D. pseudoobscura is low due to missing and rearranged TFBSs . To measure how similar the TFBSs of other species are, we aligned the TFBS-map of the putative MSE2 region of each species with the TFBS-map of D. melanogaster using MMETA. Mmeta aligns, non-colinearly, the TFBSs between two or more TFBS-maps. It does so by optimizing the mismatches of aligned labels (TF names) and their positions in the primary sequence. It returns a similarity score representing the quality of the achieved alignment and the number of aligned TFBSs. The score is therefore unbounded, with small or negative values representing many unaligned or poorly aligned TFBSs, and with large positive values indicating alignments of identical maps. To test the specificity of the model, we apply the model to the predicted TFBS-map of all windows surrounding eve. The algorithm takes a trained model, a set of data points (TF concentrations and target mRNA levels), a set of log-odds PWMs for the TFs in the model, and a genomic region as input. The algorithm computes the RMS error of windows (contiguous sub-regions of DNA) as follows. The PWMs are first used to compute a predicted TFBS-map for the window. The RMS error of the input model using the predicted TFBS-map is then computed using the input set of data points. The algorithm repeats this process for all windows of a given size and spacing along the input genomic region. We calculated the RMS error for windows spaced 10 bp apart, starting at the 5' end of the DNA surrounding eve. To determine the optimum window size, we try windows with widths in the range w = [100,..., 2000] bp in steps of 100 bp. We use the same log-odds PWMs in training and CRM prediction. In particular, we use the background model, B, for D. melanogaster, even when predicting CRMs in other organisms. We do this because changing the background model would change the log-odds scores of sites, and predicted site association constants, K s , would then be different for identical sites in different organisms. where K are the "known" genomic regions in the MSE2 (annotated or alignment-identified) and P(r) are the "predicted" genomic regions predicted by the model using an RMS threshold of r. (The vertical bars in the notation indicate the size of the regions in base pairs). A base-pair is considered as predicted if it is part of a "minimal" window whose RMS error is equal or below the threshold r. A window is only "minimal" if there is no other, smaller window contained within it, whose RMS error is equal or better. The authors wish to acknowledge John Reinitz for providing the code for the Simulated Annealing optimization and model implementation. DCB researched and carried out the experimental work under the supervision of TLB. The initial manuscript draft was written by DCB, and refined by TLB.